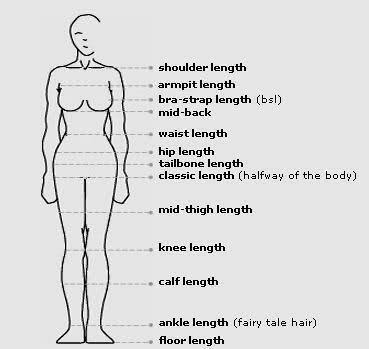 Note: Shoulder length is the same as collar-bone length. Chin length and ear length, though not indicated in this image, are pretty self-explanatory;). Hi to all my GOCers!!! First and foremost, thank you for joining the challenge!!!! I hope to provide you with a venue that will be supportive and encouraging, motivating and inspiring, helpful and useful!! However, I will need your help to make that hope a reality! I definitely cannot do this alone and will be relying on your submissions, pics, questions, updates and anything else you or I can dream up to make this a success!! Second, I want to set a framework for this challenge that will provide a structure that will help you all participate, share, as well as let you know what to expect and when. So, let’s begin!!! 1. Many of you have already indicated your goals in this post. However, it’s time to get a bit more detailed about where you are now and how you plan to achieve the goal(s) you’ve established. In order to “officially” enter the challenge, please e-mail the following information to hairscapades@gmail.com with the subject “GOC – The Sequel” by Friday, July 29th Saturday, March 31st. Name: Real, first only or alias (whatever is comfortable for you). Goal(s): If you are setting a length goal, you can use the chart above to state your current length and goal length (this will ensure that we are all speaking the same language=). If you are setting a weight loss goal, you can indicate your current weight and goal weight, your goal weight only or the amount of weight that you would like to lose over this six month period. And, remember, it’s important to set realistic and achievable goals. The goals should be a challenge, but they should also be attainable. It’s very unlikely that anyone is going to be able to go from shoulder length to waist length in 6 months. Losing 100 lbs is also probably a little fantastical. However, if you’d really like to lose 50 pounds, but set 5 as your goal, I’d suggest raising your expectations;). Pictures: Hair in its present state (front, side and back). If you are setting a length goal, a length check pic (straightened or stretched curls) is preferred. If you have a hair health goal, a quality picture demonstrating the issue or area of concern would be helpful. If you are setting a weight/fitness goal, take a picture of yourself at your current weight. Taking the picture is mandatory, submitting it is NOT. I’m very cognizant of being self-conscious about excess weight and would never force anyone to submit a “before” picture if they do not want to do so. However, though submitting the pic is optional, I believe that having a “before” picture will enable you to truly see the results of your efforts at the end of the challenge. On January 31, 2012, you may not mind publicizing that “before” picture when you can send it in with an “after”=). Regimen: Your planned routine for your hair (steps and products), diet, fitness, faith and/or any other goals. If you have no clue about what you need to do to achieve your goals and that’s why you are here, please indicate what you are currently doing (i.e. your normal hair routine, fitness routine or lack thereof, current diet, etc.). This will help us understand what you may be doing that support your goals, as well as what you may be doing that is a detriment to them. It will also enable us to make suggestions or provide you with options for your regimen. Reward: I think that it is important to reward yourself for reaching milestones as you work towards your goals. So, what will you do to reward yourself? You can set a reward for the end of the goal (i.e. a vacation, “splurge” purchase, new hair cut at that expensive salon with rave reviews, etc.) or interim rewards (i.e. internet surfing, mini purchase, etc.). You may want to check out my post on Motivation for ideas. Link(s): If you have, or plan to create, a blog, Fotki, YouTube or website to chronicle/journal your progress, please provide the link address. If you don’t have or want any of these things, I’d suggest that you keep a written journal/diary for yourself to chronicle your activities on a regular basis (i.e. daily, weekly or bi-weekly at the minimum). This information will be your official entrée into the challenge. The GOC entry submissions will be posted in groups every day over the course of the first week of the challenge (or more, depending on the number of entries that I receive). My goal is to post 10 participants a day in a single post. Individuals who would like to participate after the challenge officially begins on 8/1 may do so. The same information outlined above is required and additional entries will be posted as needed. How you did in regard to following your planned regimen (hair and health & fitness)? What tweaks have you made (did you try something new? Add something? Remove something, etc.)? What products and/or techniques did you add or remove and why? What styles did you wear? Have you had any challenges? Setbacks? Accomplishments? Don’t forget the pics!! We love to see your beautiful hair and lovely styles:)! 5. Tips & Tricks: I will (attempt;) to provide 30 days of tips to help you towards achieving hair length, thickness and/or health goals. These tips may not be on consecutive days and will not be posted on the weekends (hey, I need a break sometimes;-). I am not an expert and definitely do not know everything. So, these Tips & Tricks will be composed of things that have either worked for me or that I’ve read have worked for others. As is often said on the hair sites, no two heads of hair are the same. What works for one, may not work for another. So, please only take these as what they are, suggestions. They are not the gospel and you may find that doing something completely opposite of what is posted works for you. In fact, if you do, please say so in the comments because someone else may benefit from your regimen and learnings!! 10. Subscribe: You may want to subscribe to Hairscapades, if you haven’t already done so. This will ensure that you don’t miss any new content as you’ll be notified by e-mail when new articles are posted. I mean, you don’t have to, but I’d appreciate it=)! So guys, that’s all I’ve got! It’s enough, right?!?! If you have any suggestions or would like to contribute in any way not outlined above, please let me know!! I welcome any help that I can get as this is a full-time job … and I already have one of those! LOL! G R O W B A B Y , G R O W ! ! ! ! Want to see what the first round did? Click the links to see their submissions and use the search box to find all of the status updates of any of our challengers (please note, some challengers didn’t provide any status updates). TENTH WAVE: 46. Jen; 47. Josie; 48. Dr. B. Natural; 49. Charelle; 50. Carla; 51. Ashley F.
I tried to send the email to the www (dot) hairscapades (dot) com but it says that it is unrecognizable. Is there an alternative email address to use? Hahahaha! I’m an idiot Kendall! LOL! It was supposed to say, hairscapades (at) gmail (dot) com. It’s a new account and I’m in the habit of writing the website instead of the e-mail address!! LMBO!! I’ve corrected it now!! So sorry! I’m so excited to be apart of this!!! WHOO!!! HOO!!! Ms. Skills, I gotta a real life question for you!. I really want to be apart of the GOC, however, I just got braids and I will probably have them in at least until the first week of August. May I still be a participate even though I have braids. I’m headed to the beach and did not want to fool around with my hair. Thanks missy! Of course you can still participate! Just send me a recent pic of your natural hair (no length check pic, obviously=) and describe your current length. If you want, you can also send a pic of your hair in the braids. Thank you lady=)!! Im going to join this challenge! Ive been looking for a challenge to partake in, and it looks like I caught this one right in time! Awesome!! The more the merrier=)!! I’m flattered, no one ever said that me being a Marine was “gangsta” LMBO! I am definitely contributing to the GOC, and if anyone has anything specific they would like for me to cover please email me. what date does the contest start? I’m transitioning, so I wouldn’t know how to chart my progress. Can I still participate? Jen, seriously?!?! Never?!?! I read your blog … uhmmm, working out with elephant ankles? GANGSTA!! LOL!! How are you feeling? I hope much improved!! Can’t wait for your posts! Are you going to send me links and a proposed schedule? Oh, and you’re throwing your hat into this challenge, right? Tiffany, we start August 1st. Nancy, of course you can still participate!!! Do you have a certain plan for your transition? Like, are you getting mini chops? Do you know how much longer you would like to transition? Are you expecting to transition past the end of the challenge? As long as you can set a goal (doesn’t have to be length related … maybe it’s just health hair … ie. minimal breakage, splits, etc. ), then you’re good. Ok, Im one of those procrastinators u posted about a few days back. Just reading exactly what the GOC was. Didnt know it included weight loss. Im in. I’m gonna re-read what I need to do to formally submit myself. I can give you a schedule for August, I haven’t finished up due to my current circumstance but I get back in the states on Monday so if you are going to introduce me first this week that would be great for me and I will email you everything else. I definitely want to get into the challenge too, but I don’t really have any pics of my hair other than what I posted on Kim Cole’s GOC…and I realized quick that I AM LOST right now with all of this thick new growth and super thin relaxed hair, lol! Okay, great! I’ll use your “Who is JKoi” post with some slight modifications to introduce you. And, you can participate! Just send in one pic that would best show your hair from you other blog, even if it’s in a bun. You can also send me the one of your new growth. When you get back to the states, send me a pic with your hair out (you can stretch or just point out the line of demarcation between new growth and relaxed hair so we have an idea of how far you are along in your transition. Then, just state whatever your goals are. You know, how long you want/plan to transition? Is there a BC in your future? Mini-chop? What have you. Anywho, it sounds like it’s the perfect time for a challenge so that you can learn how to manage the new growth. I definitely think that some TnCs would be good for you. Do TnCs on wash day and then bun or protective style if you aren’t feeling the relaxed ends. But, remember to be careful with always wearing your buns in the same location. Switch them up so that you aren’t always placing tension in the same places. Also, with TnCs, you can probably rock looser, more free form buns. I wish I’ve known about this a month ago! I will still follow everyone in the GOC – great idea! Carla, you know I’ve opened this up for a Tenth Wave, right? I have one person for it and I’m seeking four more. You can start in September if you are interested. Just send me the information requested above … since you weren’t “playing from home August,” you’ll only have five months of the challenge. But, that’s fine with me if it’s fine with you! Hope you see this! I’ll try e-mailing you too! Just wondering…… What about a 2012 GOC? I did not participate in the 2011 challenge, but I am ready to commit to a 6 month challenge that will begin in the early part of 2012! I love your site because it keeps my attention due to other shared interest (comics, anime, randomness). So, are you considering a new challenge? Hey Freddie! Yes, I plan on continuing the GOC into 2012. Anyone who is in the current line-up can continue if they indicate that they want to do so. Then, I’ll do another “open enrollment” for new challengers! I expect to do that post a couple weeks into January, so stay tuned and you can start putting together your submission;)! I want to join the new GOC!!! I got my t-shirt, a goal and now a group! Woohoo!!!! Alright, come with it girlie;)!! Hello! I just sent in my email to join the new GOC! I am super excited! I’m so sad I missed the submission deadline but I will follow along. Sorry Naturally Glammed, but you can play at home like Faye here!! Thank you! One question: Do I send my initial start data and my pics to you via email? Or just document on my own? Here is my entry for the At Home-ers! LOL! Hey Faye!! You can document on your blog, but at the end of the month, do a summary of the month with pics and then send me the link to it. I’ll post it on the site! Thanks for playing along and I LOVE, “May the Growth Be With You! !” LOL!!! That is awesome!! You are a girl after my Sci-Fi loving heart:)!! YAY! Hey Shelli! I am on it! I will send you the link at the end of May. I am most definitely a Sci-Fi kinda girl! Good to know I am not alone! LOL!! Hi Dawn!! I just saw your comment today on my ApHogee post on CurlyNikki!! I posted a response there and came back to my site to search to find if you ever commented here!! And, I found this comment that I forgot to go back to when I got home from work! Sorry for the delay. Anywho, what I said on the CurlyNikki post is that I keep my full regimen in the right-hand navigation. When I do an update post, I link to my most current regimen. I am due to make an update though as I’ve been using Aubrey GPB mixed w/Vatika oil to pre-poo and I don’t think that is listed in my regimen. Also, I do have a YouTube channel, which is also linked in the right-hand navigation. Haven’t done a video in quite a while though! They are a lot of work to film and edit!! I never seem to have the time!! As to the next GOC, this one ends in September. Not sure if/when I’ll be running another one. Managing updates can be a bit time-consuming. What I’d like to do is to link to some type of forum where the ladies can post their own updates and I can just provide a pic and a link so that everyone can know when updates are posted. Still have to figure out the logistics of that though! But, if I run another one, it’ll definitely be posted in advance! Thanks for your interest!! Thanks Shellie…just read and responded to your reply. Looking forward to the Aubrey update…..after reading your initial review…I loaded up on the product and love it. HOWEVER….I have some other condish to rid my closet of…so I am alternating those with my prepoo regimine. Quick question….is the reason you don’t retwist your hair nightly due to manipulation concerns. Pineappling doesn’t work as well…so I redo my twist nightly….but fewer twist. Is that bad? Thanks again for your blog…LIFESAVER…and your product reviews are awesome. Hi Dawn, yes, that is why I don’t re-twist/braid nightly. Too much manipulation for my fine strands … I think it would cause unnecessary breakage. Pineappling isn’t the perfect solution for me either as I get tangles and matting sometimes. But, still it’s less damaging for me than manipulating every night I think! If twisting every night works for you, go for it!! Anything that works well for you is NEVER bad IMHO. I say, do what works for you regardless of what anyone else says is right or wrong. Now, if it isn’t working for you and they say it’s wrong, it probably is;). But, good and bad is all relative IMO;). If you are doing fewer twists than the original set, that is good too. And thank you so much for all of the kind words:)! I really appreciate them! !